Langham is a small parish in the north of the county close to the coast. The small village of Langham is at a crossroads in the centre of the parish, and the name derives from the Old English meaning ‘long homestead or enclosure’. The earliest archaeological evidence from the parish includes prehistoric pot boilers (NHER 3198), a flint flake (NHER 32186) and other prehistoric flints (NHER 32262). Neolithic flints (NHER 15637), a Neolithic axehead (NHER 28519), a flint laurel leaf (NHER 32182), a Neolithic jade axe (NHER 13906) and a fragment of Neolithic or Iron Age pottery (NHER 34953) have been found, as well as a Beaker barbed and tanged arrowhead (NHER 22867). A Bronze Age barrow (NHER 6153) is clearly visible as an earthwork on aerial photographs near East Hall Farm. An excavation in 1936 revealed that the barrow was reused for an Early Saxon burial, and an Early Saxon spear and shield boss were found. 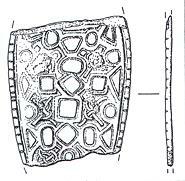 Several Bronze Age socketed axeheads (NHER 1879, 25252, 32184, 32831, 34661) have been found by metal detectorists. There is some evidence of Iron Age activity in the parish. In 2002 the NAU carried out an archaeological evaluation close to The Spinney. 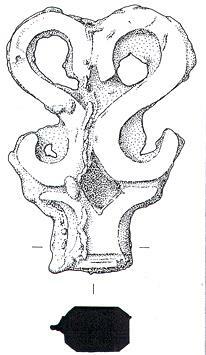 The evaluation revealed an Iron Age post-hole containing a fragment of Iron Age pottery (NHER 36872). Although no Roman settlement sites have yet been identified in the parish, several Roman finds have been recovered including coins (NHER 6154, 32180, 32181, 32185, 32186, 32831, 34661, 34952, 42636), a ring (NHER 25252), a bracelet (NHER 25252), brooches (NHER 32181, 32185, 34952) and fragments of pottery (NHER 32181, 32262, 42636). The skeleton of a young man and fragments of Roman pottery (NHER 9864) were discovered during the construction of a new water pipe in 1976. Early Saxon brooches (NHER 21566, 25252, 32180, 32181), a fragment of Middle Saxon pottery (NHER 41721), a Middle or Late Saxon strap end (NHER 42636) and Late Saxon finds including pottery (NHER 25252, 32262), strap fittings (NHER 32180, 32181), a strap-end (NHER 32831), and an earring or finger ring (NHER 32185) have been found. In 1086 Langham was entirely in the hands of the Bishop of Thetford, and the Domesday Book records 31 villagers and 17 freemen, a mill and 2 churches. St Mary’s Church (NHER 6165) was the parish church of the lost village of Langham Parva. The church stood close to the fork in Binham Road, and there are now no upstanding remains of the church, which was in ruins by the early 17th century. The parishes of Cockthorpe and Langham Parva were united with Blakeney and Glandford in 1743, when St Mary’s was described as ‘demolished beyond the memory of man’. St Andrew’s and St Mary’s Church (NHER 6172) dates mainly to the 14th century, and stands at the crossroads in the centre of the village. The church contains a 13th century octagonal font that bears an interesting graffito - 'Alice Nettleton baptised the 14th day of April 1692'. The north window was designed by Sir Edward Burne-Jones for Morris & Co. in 1894. The earthwork remains of three medieval moats (NHER 11324, 11334, 6174) have been recorded from aerial photographs. A probable medieval dam has been recorded in a wood close to the parish boundary with Binham. The dam may be part of a medieval fishpond that was associated with Binham Priory, and another medieval fishpond (NHER 24412) lies close by. Medieval pottery coins and metal finds have been found by metal detectorists, including a 14th century base-metal copy of a silver penny (NHER 34661) and a 14th century seal that has been identified as belonging to a woman named Alice of Cossington (NHER 40490). A post medieval road (NHER 27728) is visible as a cropmark on aerial photographs leading away from Holt Road. The course of the lost road is clearly marked on Faden’s map of 1797. 21 North Street (NHER 40324) is a late 16th century flint and brick house with a blocked 17th century mullioned window. Orchard House (NHER 44306) is also a 16th century flint and brick house with 17th century features. Key’s House (NHER 44304) is a double-pile house dating to the 17th century with later alterations. The house has a two-storey entrance tower and a 17th century service wing. Rowan’s Cottage (NHER 44307) and The Bluebell (NHER 44308) both date to the 17th or 18th centuries. Crafer’s and Seeley’s Barns (NHER 40322) both date back to the 17th century with patches of later brickwork. The barns have now been converted into houses. Langham Glassworks (NHER 40323) is housed in a range of early 18th century brick and flint barns and a 19th century cart shed. Langham Hall (NHER 6173) was built in the Greek Revival style in about 1820 and was used as a hospital by the RAF during World War Two. Grove Farmhouse (NHER 44302) is a gault brick farmhouse dating to about 1840. Two windmills (NHER 15211) are shown to the north of Mill House on Faden’s map of 1797. Only one windmill is shown on Bryant’s map of 1826, and was last used in 1872. Langham Lodge (NHER 44305) was built in 1885 in the Domestic Revival style for Lord Suffield, who promoted 19th century development of Cromer. The Lodge stands on the site of Manor Cottage, which was the home of Captain Marryat, who wrote the classic children’s novel ‘The Children of the New Forest’ here. Marryat had a distinguished career in the Royal Navy and built a 'quarter deck' at the house, from which he could observe ships at sea. Langham Airfield (NHER 1891) was constructed during World War Two. Some buildings are still standing on the airfield, including a dome trainer, one of only three surviving examples in the country. The dome was used for training anti-aircraft gunners, who fired at films of enemy planes that were projected onto the walls. During World War Two a military camp (NHER 19175) was established on land immediately behind the parish church. In 1983 the foundations of the 19th century cottages that stood on the site before the war were revealed, but no evidence of earlier occupation was found. Several other camps (NHER 27772, 27773) were established to the north of the village, and are visible on aerial photographs taken by the RAF in the 1940s. Aerial photographs taken during the war also show a searchlight battery (NHER 33693) to the northeast of the village, and a radar station (NHER 27774) to the south. Sarah Spooner (NLA), 16 May 2006.